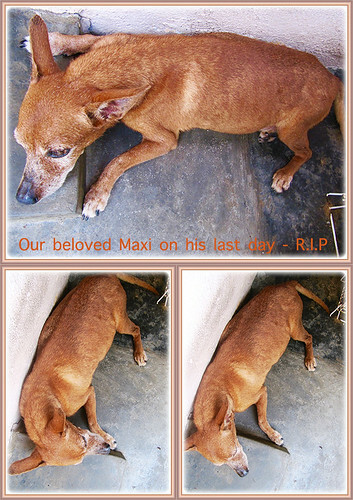 Our dearest, darling and beloved pet, Maxi had gone to heaven, a better place where there’s no more pain and suffering. He had been sick for about 2 months with a weak heart and lungs, worsening as time progressed with water retention in his lungs. It had been an ordeal seeing him suffering. R.I.P our lovable and adorable boy! 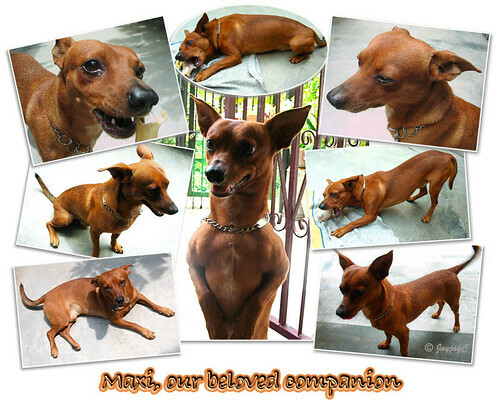 A poem by unknown author in tribute to our darling Maxi, a miniature pinscher….
. . . a loving soul I’ll never forget. Another shot of him taken this morning. He was embraced by our Loving Father into heaven at about 3 o’clock in the afternoon. Thank you so much, darling Maxi for giving us so much laughter, joy and happiness for ten and a half years. For dog years, it’ll be equivalent to 73½ years with us, that is, 10.5 multiply by 7. And, we praise and thank God too for the gift of Maxi in our golden years. We miss you so very much, our beloved and adorable boy!! But I know Maxi will not find anyone more fitting than you and John. Bye bye Maxi. You have been loved all your life. Thank you very much, dear Ivy Loh for sharing loss of our beloved and darling Maxi boy. We miss him so terribly and still shed tears thinking about our beloved pet. RIP our dearest boy and our beloved family member!